I hear many women say how hard it is to find beautiful, modest clothing. It is true, that clothing that is feminine and doesn't bare all can be extremely hard to find. Just the other day, a woman at the store complimented my daughter and I for our pretty, long skirts and mentioned how difficult it is to find decent clothing these days. I was wearing a skirt from New Creation apparel and my daughter had on a skirt that was a gift. 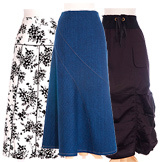 I have mentioned before to you how I love New Creation Apparel, which sells gorgeous, modest skirts (yes, even maternity skirts!) I also came across a video that shows many other sources to obtain modest skirts all over the world (and yes, the video mentions New Creation Apparel as well). So take heart, they are out there, and I hope this blesses you. Thank you so much for this - I have just purchased (locally) 4 long, ankle-length skirts. However, it is largely due to the blessing that this type of clothing is in style where I live. We all know that styles come and go! So, this post is extremely welcome as I do need other options. You are so welcome, Eileen. I'm glad it was helpful. I do love skirts but I don't wear them. My poor bosy is so twisted, they never hang properly! LOL! Mrs. Q, thank you so much for this link, I had just a few minutes to look around because I had something else that needed to be done, but my eldest daughter and I will be purchasing from this site later when we get a chance to look around more, but I did see one that I really liked.. Wonderful! I'm so glad to hear it. Blessings to you. These are all lovely...thank you for sharing! Some lovely skirts but very few in the UK.